When the going get tough, make cake! I was not a tofu lover until I came to St Louis. I ate tofu occasionally when someone offered to cook for me or when I dined out. Cooking tofu at home was a skill I acquired here. When I suddenly decided to take a liking to tofu. I still remember the first time I cooked tofu at my old apartment. The moment the tofu touched the hot oil, the oil splattered every where. The floor, the stovetop and more painfully my hands; even though I had the cover of the wok as my shield. I was defeated by the seemingly harmless looking block of tofu. Ever since then, I convinced myself that cooking tofu at home was risky business and shall never be attempted again. After I came to St Louis, I acquainted with tofu after my scientist husband told me the correct way to handle a block of tofu. He gently reminded me of the basic nature of the reaction between water and oil, and more importantly how to avoid splatter of oil when one cooks tofu. The key, as he plainly pointed out is to drain the tofu, and make sure that the surface of the tofu is dry before adding them to the oil. I guess any experienced cooks have probably known this, but that was two years ago while I started to cook. 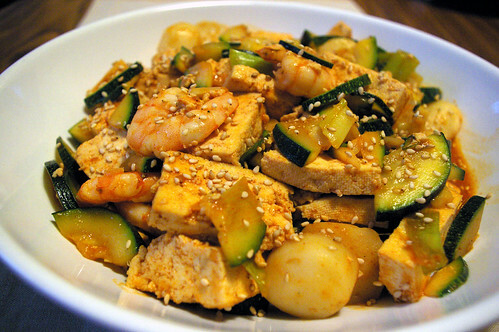 Like the ending of a fairy tale, I live a happy ever life cooking and eating tofu since then. Now, I cook tofu every week without worrying about the splattering. One trick that I learned and have never share with anybody though, is to wear an oven glove if you still worry about the splattering. The oil may dirty your glove but it will never kiss the delicate skin of your fingers! Enough about the tips. I have a real good tofu recipe to share tonight. I woul call it seafood tofu with Gochujang sauce. It's a sweet and spicy recipe that comes together in a flash, and packed full of flavor. Making it suitable for week night dinner with a big bowl of rice. Heat oil in a non-stick skillet until hot. Add in tofu cubes and make sure all the tofu cubes are in contact with the surface of the skillet. Cook for about 3 minutes until one side of the tofu turned brown from searing. Add in garlic, zucchini, scallion and sesame oil. Stirfry until the zucchini turned soft. About 2 minutes. Add shrimps and fish balls. Continue to cook until the shrimps turn pink. Add a heaping tablespoon of Gochujang to the tofu mixture followed by chicken broth. Bring the mixture to a boil and add mirin, sugar, salt and pepper to taste. 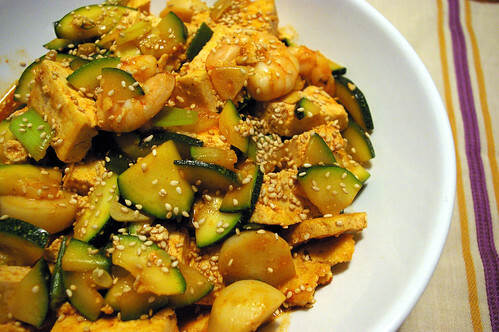 You can add more gochujang if you preferred a spicier dish. If the dish turned out spicier than you can handle, add more sugar to dilute the spiciness. *Gochujang can be found at Asian grocery stores. I still remember the summer I first set foot in Perth. It was almost Christmas time and I felt like a melting scoop of ice-cream. The sweltering heat made me want to just stay in Uncle Michael's cosy house and not doing anything. Having said that, it was a memorable trip for many reasons, but one of the highlights, was the pavlova my aunt Kim served on Christmas morning. I remembered how the faces of my little cousins lit up when they saw the pavlova. According to the very health conscious family, they ate pavlova (and bacon) only once a year on Christmas morning. Oh well, I wasn't in the position to comment on their habits, but I certainly didn't see what's the deal with this seemingly pale looking "fruit tart". To be polite, I asked for a small slice not knowing what exactly lay ahead of me. And frankly, I wasn't exactly into anything that didn't have chocolate on it. But the first bite totally converted me! It was the most intriguing dessert I have ever eaten in my 19 years of life! How should I describe my first pavlova experience? It was a generous stack of summer fruits on a bed of snowy white cream, supported by a sturdy meringue shell. Obviously, I had never heard of meringue at that time. So you can just imagine my excitement when I first put a tentatively small bite of pavlova into my mouth, and sensed the instant melting of meringue. It was a revealing moment. I quickly took a second bite, and the pillowy center of the meringue mixed with fruits reminded me of mashmellow with fruits. That was the coolest dessert I had ever eaten. While I was having this revealing experience with my tiny slice of pavlova, the rest was promptly gobbled up by my relatives. It was quite sad that I couldn't have a second serving, and that pretty much sum up my pavlova experience. Pavlova is the kind of dessert that once tasted, one will never forget. At least, that is the case for me. Many years have passed, and I never have another chance to taste pavlova again. I don't know why I didn't search for one the last time I was in Sydney. Perhaps I was scared of being disappointed by my memory. You know how sometime when you crave for something badly, it seems to be ten times more delicious than it actually is. So I didn't look for it. Last week, while reading the Domestic Goddess Jeniffer's gorgeous blog, she asked other bloggers to post about their most craved, favorite desserts for the sweetest blog event that she is hosting. Naturally, pavlova came to mind. It was my most craved dessert that I couldn't believe I have waited so long to make! Thank to the little nudge, I have finally reunited with my long lost love. And it didn't disappoint. I took the liberty to include Pierre Herme's lemon cream into the whipped cream, and used the berries I got from the farmer's market. It was a perfect ending for a dinner party we hosted last weekend. This is also my first entry to the Sugar High Fridays. Be sure to check out other food blogger's Sweetest Thing on Jennifer's blog on 29 June. With the abundant of summer fruits, you shouldn't be surprised to see another pavlova popped up on my blog some time real soon! Pile the meringue into the middle of the circle on the parchment paper and smooth it within the circle, making a rough disk. Bake for 1 1/2 hours until the outer side feel dry and hard when touched. Turn off the oven, keep the door ajar, and allow the meringue to cool completely in the oven, about 1 hour. It will be crisp on the outside and soft on the inside. Invert the meringue disk onto a plate and spread the top completely with sweetened whipped cream. Spoon the berries carefully into the middle of the Pavlova, leaving a border of cream and meringue. People love summer for a multitude of reasons. The students love them for the summer breaks, some men love them for the bikini babes walking down the beaches. And I love summer because of the abundant berries that come with it. There are so many juicy sweet fruits waiting to be devoured in summer. While many fruits are delicious to be eaten as they are. I much prefer to take the opportunities to make some pretty desserts out of them. This is my third entry featuring strawberries. This time as a dessert. And also a berry best one too. After this, I will be making something from other berries, like raspberries! I can hardly wait to see them in a dessert for the Saturday gathering. Coming back to the faux summer pudding. It is a recipe from Pierre Herme's Desserts Book. The first time I saw this recipe, I know I wanted to have a piece of the pudding. But the multitude of instructions deterred my initial enthusiasm. Until a loaf of stale white bread that OCT left in the fridge nudged me to finally "just make it". It's funny that sometime I got around making things that I put off for many reasons (mostly because of the complicated steps) just because of the impending expiring dates. Maybe it's the sense of urgency that an expiring product imposes. I definitely won't be making half as many recipes you see here if all the products/produces can last forever. The bottom line is, I made the faux summer pudding and it tasted good! PH has very specific instructions for the pudding, such as "Eat the pudding once it's assembled"! It doesn't tell why. It is simply a command from the master. Because the stake of failing the pudding project was high, I didn't alert my friend earlier. In fact, I called them after I had assembled and tasted the pudding! Well, you can't blame me. The many steps of the recipes made me a bit neurotic. What if I told them on the first day and the cream didn't harden on the second day? Or what if I couldn't get the lemon cream right? It was also quite possible that the pudding would fall apart once the springform ring was removed. If any of the above happened, then there would be no desserts! And I would have broken all my friends' hearts who so look forward for a scumptious dessert after a hard day at work, just to find that it was a flop? Luckily, it turned out well. At least I like the pudding a lot. It was indeed a refreshing and light dessert fitting for a summer night. OCT however, thought it wasn't sweet enough. And hence it wasn't his kind of dessert. Oh well, I am more than happy to eat up his share of the pudding! Because the recipe stated that the pudding has to served chilled, I took it a step further by putting it in the freezer before my friends came to collect it. I was worried that the pudding would break down and started to sweat on their ways home under the merciless weather. Then this morning, my friend gave me her feedback on the pudding and commented that she especially liked the frozen strawberries! I laughed so hard that my stomach hurted when I read that. Isn't the frozen strawberries my stroke of brilliant? While this dessert may be a perfect ending for a meal, cutting them into separate servings to be distributed( like what I did) may not be a good idea. Because of the lack of defining structure, the pudding looks like a puddle of cream with fruits. It surely doesn't look like the most appetising dessert monsieur Pierre would serve. After a dose of healthy smoothies in the morning, I decided to have something light for lunch. The smoothies is so filling that I didn't feel hungry comes lunch time. But my biological clock sent a signal to my mouth, and told her to munch something eventhough the stomach protested that she was feeling pretty ok and didn't need to be fed yet. Rather than reaching for potato chips or something equally unhealthy, I made myself a simple fruit salad. It's actually the leftover salad from last night with a few strawberries thrown in for color. Surprisely, it was pretty tasty. I would have added some raspberries if I had gotten them from the farmer market last weekend. But we went a bit late, so there wasn't a single punnet left. What a disappointment! We bought a lot of strawberries though. So much that I have enough to eat for breakfast, lunch, snack and desserts. In as short as three days, three pounds of strawberries are gone. Most of them went into the dessert, which I will blog about shortly in another entry. This post is about the berry simple salad. It is basically a combination of romaine lettuce, tomatoes and sliced strawberries. I mixed a teaspoon of raspberry perserve and a few dashes of balsamic vinegar to make a simple dressing for the salad. The dressing is pretty much up to personal taste. But I like the interplay of something sweet and something tangy in my salad. I am sure any balsamic vinaigrette will work here too . Also, any mixed salad green can substitute the romaine lettuce. A figure friendly salad that will surely help my thighs and hips. This berry simple salad will be my entry for Lisa and Kelly's Salad Stravaganza. Do check out the roundup on July 1st for other yummy salad ideas! Serves one girl who needs to lose weight. I was awakened early by OCT today on his way out to work and couldn't get back to sleep after that. Eventhough it's early in the day, I found myself sweating. It was the heat from the merciless sun this time of the year! Eventhough I could turn on the air-conditioner and cool myself down, I opted for some fresh morning air. Which comes with the warm wind unfortunately. I remember when I was a kid, I used to go to the refrigerator and opened the fridge wide open to let the cold air blow on me. Until my mum found me and reprimanded my silly act. While I was older and tall enough to open the freezer, I pretend to find something from the freezer whenever the weather got unbearably hot. Today's weather reminds me of my little game with the refrigerator. Instead of trying to "look for something" from the freezer, I reached out for the tub of ice cream. I almost wanted to eat ice cream for breakfast!!! Well, I know I am capable of doing that eventhough I haven't done so..Luckily, I was saved by the frozen raspberries and mango that were tucked behind the ice cream. For they screamed "choose me, eat me!" So loud that I had to cover my ears with both hands and let the ice cream idea dropped to the floor. You know how people tell you that "life is about making choices and you are what you eat?" I couldn't agree more. And for today, I am proud that I made a conscious, healthy choice to start my day. I made myself a cup of berries smoothies. Not only has it cooled me down, it has also packed with lots of "good for me", anti-oxidant rich ingredients. I must also add that the purplish pink hue of the smoothies is really pleasing to the eye. I am submitting this smoothies to Sweetnick's ARF/5-A-Day Tuesday. Check out her blog later for more ARF ideas! Blend everything together in the blender and pour into a cup. Enjoy! I usually just put whatever berries I can find into the smoothies, but banana is always included for sweetness. For the past two days, I have been obsessed with changing the layout of my blog. I wanted to make it into three columns instead of two, and added in other interesting stuffs. Something that I believe some people can do within half an hour (or shorter?) with one eye close. Not for me. I spent two days to research on various options and finally come up with the layout you now see. Eventhough I wanted to add more fancy stuffs to my sidebars, I guess I have to settle with what I have now. I am exhausted. I need to do something relaxing. Like baking. Something I can definitely do better than modifying CSS codes. Moreover, there's treats for OCT Friday lab meeting and a friend's birthday cake to think about. 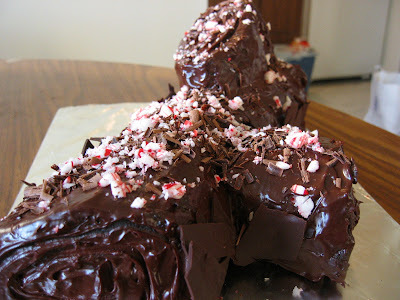 There are several recipes in my consideration, and I finally settled on the Black and White Angel Food Cake. I have been wanting to make it since it appeared on Cookinglight's May 2007 cover. This was my first time making angel food cake, so I was a bit apprehensive. Adhering closely to the recipe (but not completely), I was relieved that my angel food cake turned out the way it should. After waiting impatiently for it to cool down slightly, I poured the chocolate gananche, leftover from making chocolate tarts onto the cake. Before the gananche has time to harden, I couldn't wait another second to cut into the cake. This was the usual "quality control" I practiced before anything goes to OCT's lab. And intuitively, I cut a larger slice than my usual "QC" slice. Perhaps, it's love at first sight. The second I saw the cake when it was turned out onto the cooling rack, I know I have fallen in love with it. After my first bite, this love feeling is rightly confirmed. The cotton candy like texture, so light and yet flavorful. I added an additional tablespoon of cocoa powder, so the chocolate layer has a distinct contrast to the vanilla layer. The original recipe used chocolate and cream cheese icing, but I was too tired to make the icings and used the leftover gananche. It's serendipity. I believe the cake tasted better with gananche than the icings. I can't believe I have waited so long to make an angel food cake! And why didn't I buy the angel food pan before all the other baking pans! The only downside though, is the leftover of 10 eggyolks. They are waiting to be transformed into some high colesterol, bad for you dessert. p/s: Among some of the things I added to my sidebar, allow me to draw your attention to the Foodie Blogroll, a blogroll created by The Leftover Queen especially for foodies! Check out the list of the food blogs that's getting longer and longer each day! Before we went to Phoenix, I was on a mission to use up some of the expiring whipping cream. I was thinking of making a frosted cake initially, but thought that would not be realistic. Instead, I went to Pierre Herme's Chocolate Desserts for inspiration. There are so many chocolate tarts recipes I have intended to try from this amazing book. But due to time constraint, I settled on the simple chocolate gananche, which could also be used as filling in tarts. Since I still have some leftover dough from the Chocolate Hazelnut Sables, I used them to make the mini tart shells. That way, I only needed to make the ganache and poured them into the baked shells. It's the simplest and fastest way to use up the whipping cream. I also added some chopped hazelnuts to the baked tart shells before pouring in the chocolate ganache. For some reasons, I simply love the combination of hazelnut and chocolate since young. Maybe it reminds me of nutella. I have never heard of anybody who doesn't like nutella! So this is my simple chocolate tart before we embarked on our journey to the desert. We gave away most tarts to friends and keep just two for ourselves. This is my sweet way to say "Goodbye!" If I have to choose one colour to represent summer, that would undoubtedly be RED. The reason is obvious. Summer is always red hot. More so now than ever, because we are in the desert. To be precise, we are in Phoenix visiting OCT's friend now. While we are here, we also visited the Grand Canyon and Zion Valley National Park. My skin tone must have been darken by more than 3 shades after exposing myself long hours under the sun. Speaking of summer, the hot and spicy Thailand cuisine comes to mind. Although I haven't been cooking these few days, I would like to share this sweet and sour pork dish that I made the day before we left for Phoenix. It's a Thai recipe that I made for the second time. Not only is it delicious, it is also fully packed with anti-oxidant rich ingredients. The combination of red peppers, tomatoes and pineapple produced a sweet and sour flavour, which is unmistakably unique to Southeast Asia dishes. Chilli is optional here though. If you prefer to have something spicy, feel free to add chilli or hot sauce. Or you can totally omit it without affecting the flavour of the dish. This simple sweet and sour pork is an easy recipe to make at home while we have craving for Thai food. 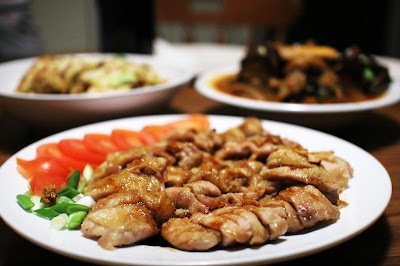 We find ourselves eating more than our usual share of rice whenever this dish is served for dinner! I am submitting this sweet and sour pork for my first ever ARF/5-A-Day. 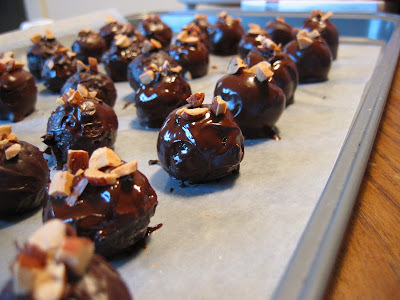 Be sure to check out Cate's lovely Sweetnicks on Tuesday for the round-up and other ARF ideas! Back to the time when I didn't have an oven in my Singapore apartment, I used to buy Sara Lee's pound cake all the time. There was always at least one loaf in the fridge at anytime. It had became an habit to just grab a pack whenever I did grocery shopping. I particularly like their chocolate and chocolate swirl flavour. Eventhough these pound cakes are not freshly made, they have an irresistible appeal to me. Maybe it's the convenience these pound cakes offered. They could be kept in the fridge infinitely. Recently, I found a recipe of chocolate marble cake from Alice Medrich's amazing book,Chocolate and The Art of Low Fat Desserts that reminds me of my old flame. Maybe they don't taste exactly the same, but I think they are pretty close. Alice Medrich's version is tender and flavourful. It is also not overly sweet and dry, like other low fat recipes. A welcome surprise to me, and I feel good to share this with friends. Adorned with bing cherries and strawberries I bought from the farmer's market, it's a simple and healthy treats to eat anytime of the day! Have all ingredients at room temp. Preheat oven to 350 degrees with rack in the lower third of the oven. Spray 8-10 cup tube pan with cooking spray. Use a large spoon to fill the bottom of the pan with about three quarters of the white batter placed in dollops. Cover the white batter with dollops of chocolate batter. Top the chocolate batter with small dollops of white batter spaced so that the chocolate batter shows through. Use a table knife to marble the batters together with a circular or zigzag motion; be careful not to blend them too much. Bake for 45-50 minutes or until the cake starts to pull away from the sides of the pan and a toothpick inserted in comes out clean. As much as I love to eat, I find myself skipping lunch most of the days. Not that I am trying to go on a diet, although I probably should, judging from my escalating weights. The actual reason though, is because I snack all the time! There's always cookies, muffins, tarts or cakes lying around. There's no real incentive to make lunch for myself. Not even a simple sandwich. I am simply too lazy to make myself lunch. Last week however, after flipping through the April 2007 Gourmet magazine, I found myself craving for one of the recipe - the shrimp and mango salad with glass noodles. Other than the basil that the recipe required, I had everything on hand. So, I got up and make myself this light summer lunch. Obviously, I have a soft spot for anything that has mango and shrimp in it. Cover noodles with boiling-hot water in a large bowl and let stand 8 minutes. Drain noodles in a colander and rinse with cold running water. Drain well, then return to bowl. While noodles are soaking, combine shrimp, mango, scallions, basil, and chile in another large bowl. Serve noodles topped with shrimp salad. Note: I add one chopped avocado to the salad. Indeed. Change is inevitable, and hopefully for the better. If you have been here before, you would remember me as the "novice baker". That was my identity when I started this blog almost 2 years ago. The time when I knew zero about baking, and cautiously taking my baby steps to learn to bake and cook in a foreign land. Two years has passed. It wasn't a long time, but it was neither a short time. I made some silly mistakes and threw away some inedible concortions along the way, but more importantly I learned not to do things in certain ways. Like whisking cold egg white in the mixer? No, it will not rise, and certainly it will never triple in volume. I love to eat. I am constantly hunting for good food. And when I am not eating, I am probably dreaming or thinking of what to eat the next second. But I wasn't a cook, neither was I a baker. When I was staying in the food paradise where good foods are abundant and affordable, cooking was the last thing I wanted to do. The pleasure of eating good food the moment you craved for it is immensely gratifying. I learned to cook and bake when I first moved to St Louis, to join my husband (aka OCT) in his last year of grad school. Leaving a corporate job and having all the time that I once lacked, I started to discover the pleasure of cooking and baking. A craft that I never had the chance to learn as a kid. Actually the opportunity was always there, since my mum was a good baker herself. But I chose to chase after other frivolous pursuits. Joining OCT in St Louis means we will have more quality time together, after going on a long distant relationship for 4 years. But it also means we have to live within a tight budget, since I no longer have the dispensable income. Naturally, eating out is no longer a luxury we can afford as frequent as we would love. But I. Love. To. Eat! So, in order to feed my eating enthusiasm, I started cooking and baking. I bake everything and anything I crave, from Chocolate Cake to Cheesecake, as long as I can find a reliable recipe. So this is how it begins. A blog is started to record my adventure and misadventure in my tiny kitchen. The place where I spend my happiest time as well as the most frustrated time (when the white eggs didn't triple). Novice baker was an anonymous identity I used for almost 2 years now. It was a perfect excuse I used when something didn't turn out the way it should. "Because, I am a novice baker". Two years of trials and errors and more bittersweet experiments in the kitchen later, I am a better cook and baker now. Though there are still a whole universe of culinary wisdom awaiting me. I will keep learning, cooking, baking and make mistakes if that's what it takes to make me a better cook. But for now, I just want to introduce myself. My name is Mandy, and I will be your hostess here. I hope you will be entertained by my adventure in the kitchen, and I look forward to know you, my guest a little better. Comments and suggestions are always welcome. Friends, I have some good news to share! After enduring a long period of vacation-less time, we are finally going to visit OCT's friend in Phoenix end of this week! While we are there, we will be going on a little road trip to Grand Canyon too. But before we go, I need to clear the content of my fridge. There are too many fresh produce I bought on impulse in our last trip to the farmer's market. Which I optimistically thought we would be able to gobble down by this Thursday. You know what, sometime a little stress is good. It makes me creative. Instead of searching through piles of recipes to see if there is one using all the produces I have, I simply fire up the stove and started cooking without a recipe. And I must say both OCT and myself are pretty satisfied with the end result! Then again, with the freshest ingredients on hand, how wrong can a dish turned out? I decided to jot down the recipe so that when I am strucked with the same fresh ingredients in the future, which is highly likely, I will know exactly what to do with them. If you happen to have the same stuff in your fridge right now and don't know what to do with them, I encourage you to give this a try. Not that I think this scenario is remotely likely, but here's the recipe anyway. Quite pleased with my creation, I am also submitting my triple S pasta to Ruth's Presto Pasta Night #15. Check out Ruth's blog and the round-up of Presto Pasta Night #15 this Friday for more pasta ideas! Heat about 3 tablespoon of oil in a non-stick skillet, add in the onion and garlic. Stir and cook until the onion is soft, about 5 minutes. Next, add in the sliced sweet peppers and continue to cook for 2 minutes or until the peppers are soft.Then add the sausages,pinch them out from the casings to about 1-inch pieces, turn heat to medium high. Cook until the sausages are no longer pink. This will take another 5 to 7 minutes. Meanwhile cook the campanelle according to the direction on box until al-dente and drain. When the sausages are cooked, add in shrimps. Followed by the diced tomatoes and sambal chilli and bring it to a simmer. At this point, you can season the sauce with a teaspoon of brown sugar, salt and pepper. Taste the sauce, go easy with the salt. It's easier to adjust the saltiness later. Pour in the red wine. Again, it's to your taste. You can add more, or less, or omit it altogether. Give the sauce about 1 minute to boil off some of the alcohol. Pour the cooked campanelle into the skillet and mix well with the sauce. Stir in the grated pecorino cheese. Summer hasn't officially begun, but the heat has already made me missing the cold winter and snow! Yes, I know I am weird. Maybe because I am never a sunny girl (I prefer to stay in shade whenever possible) and swimming is definitely not my thing (in fact, I am aqua-phobic), so I feel quite awkward when summer approaches. Especially so when shops start displaying bikinis on their windows, and people start talking about going to beaches more often than any other time of the year. I can only nod, but feel sorry that I can't share the same enthusiasm for summer. The only reason I like summer, I guess, is the arrival of juicy sweet summer fruits!!!! Would you be shocked if I tell you I come from Sabah, a beautiful place surrounded by sea and beautiful islands? It is a secluded little place that not many tourists know. If you have been following The Survivor, one season was recorded in a place called Pulau Tiga, not too far from where I stay. Isn't that cool? The place was promptly turned into a tourist attraction. Despite of the abundance of beautiful beaches, I never picked up swimming, and would rather sit under a shady place to drink coconut juice and eat Satays while the rest of my friends went for a dip in the sea. That is my ideal of beach outings. I would kindly agree to look after their belongings. Anyway, let's talk about the food-related stuff. While searching for ideas on what to make for OCT's Friday lab meeting, I decided to go back to my favorite "Barefoot Contessa" and make one recipe from it. I chose the coconut cupcakes, which Ina also included a large cake version in her latest book. I wanted to make cupcakes, because they are easier to eat in the meeting. Like the rest of the Barefoot Contessa recipes, the coconut cupcakes are nice. But to be perfectly honest, I secretly hoped that the coconut flavor can be more distinct. Ina's coconut cupcakes get their coconut flavor solely from the shredded coconut, which I find not sufficient to impart the quintessential coconut taste I am after. Of course taste is something highly subjective. And people have different preference. OCT tried the coconut cupcakes and find the flavor to be perfectly balanced. The rest of his colleagues are divided into two camps. Those who tried like it, the one who didn't, refused to eat because there is no chocolate in it. And his name is Shaun. A funny guy that has been eating whatever I baked except this coconut cupcake. In the spirit of experiments, I may try to replace some of the buttermilk with coconut milk next time and see if the flavor can be further enhanced.